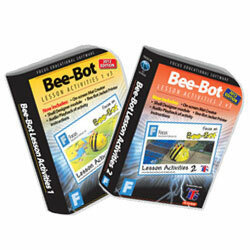 Focus on Bee-Bot: Lesson Activities is a cross-curricular interactive program based on the popular Bee-Bot programmable floor robot. This resource is an excellent starting point for teaching control, directional language and programming to young children. It is suitable for both individual study and whole class whiteboard teaching. The software includes a range of activities for each cross-curricular activity mat. Challenges are solved by programming sequences of moves on-screen with feed-back given when tasks have been completed. Children create their own on-screen activity mats and build and save 3D Bee-Bot worlds. 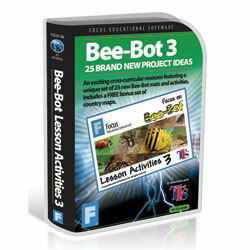 The program can be personalised by each user creating fabulous Bee-Bot shells on-screen. This encourages the development of image manipulation skills and can be linked to practical activities, such as printing and cutting out the designs for use as Bee-Bot jackets. Inexperienced readers can listen to recordings of the activity instructions. This is based on eight well-known TTS cross-curricular activity mats including: Alphabet, Money, Race Track, Shapes and Colours, Busy Street, Treasure Island, CVC and Number Track. This is based on eight well-known TTS cross-curricular activity mats including: Farmyard, Seaside, Fairy Tale, Katie Morag, Community, World Map, UK Map, Bee-Bot's Home. Lesson Activities 3 - Finalist in the 2015 BETT Awards! The software includes a range of activities for 25 brand new Bee-Bot cross-curricular activity mats including Minibeasts, New & Old Toys and People Who Help Us. Challenges are solved by programming sequences of moves on-screen with feed-back given at the end of each task. FREE On-Screen Maps of the World - Included with Bee-Bot Lesson Activities 3 is a free bonus pack of 24 on-screen country maps and regions.